The City Place at Pineapple development will feature restaurants, shopping and 267 elegant condominium residences in a 13 story modern condominium. It is located in the heart of downtown Sarasota. There will be 30-40 retail outlets. A 30 foot pedestrian breezeway will be a major feature of the project. Reservations are now being accepted for one, two and three bedroom residences. More than one-third of the condos have already been reserved. There are 30 different floor plans ranging in size from 850 to 2100 square feet. Prices start in the $600,000s. Contact us today for more information on reserving a condominium in this exciting development. Construction begins Spring/Summer 2007. 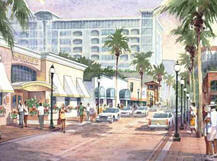 Check back for updates on City Place at Pineapple Square Sarasota condos for sale. If you are considering a purchase or need additional information, call us at 941-544-6467.